Wonton soup is one of my favorite comfort foods. I think of it as Asian chicken noodle soup, and it’s what I want on those rare occasions when I’m sick. However, I eat it a lot, sick or not. Because I feel like crap on toast when I’m sick, I freeze trays of wontons, as well as containers of broth made from my old stewing hens, so soup can happen with minimal effort. Everyone knows good old chicken soup is just what’s needed for a cold, but how much better, when you throw in garlic and ginger? The recipe I give will make approximately 40-50 wontons. 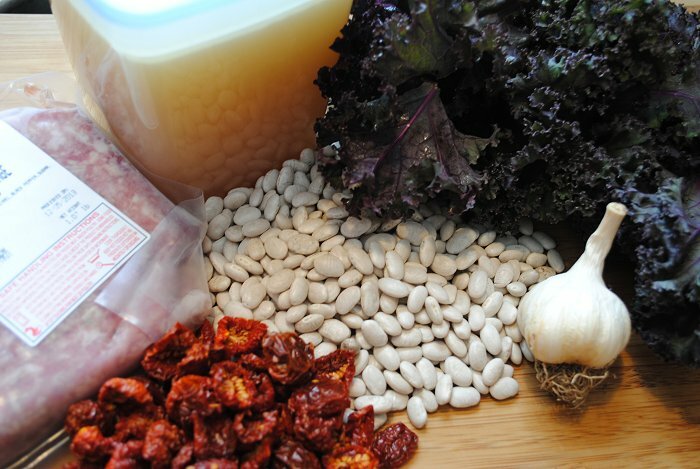 This is more than you will need to make a batch of soup. Freeze what you don’t use for later. 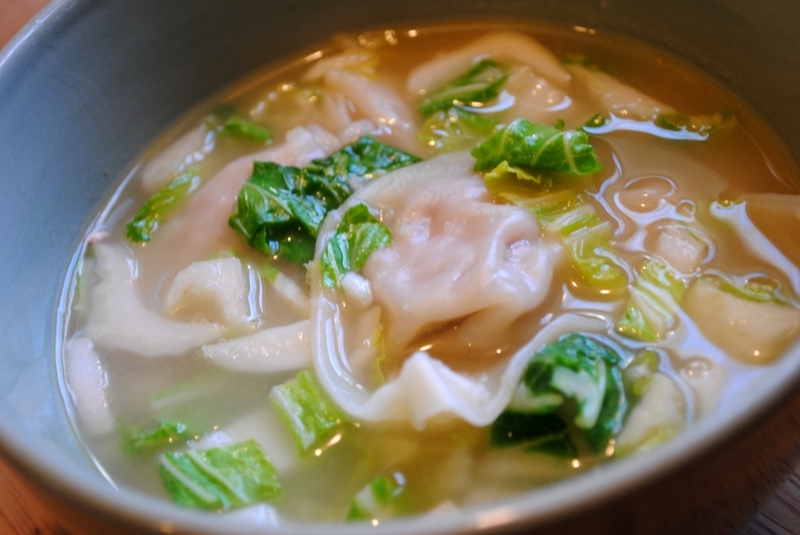 The wontons can be added to the cooking broth fresh or frozen. Combine ground pork, ginger, garlic, and sesame oil, and mix well. Fold using any number of different folds. 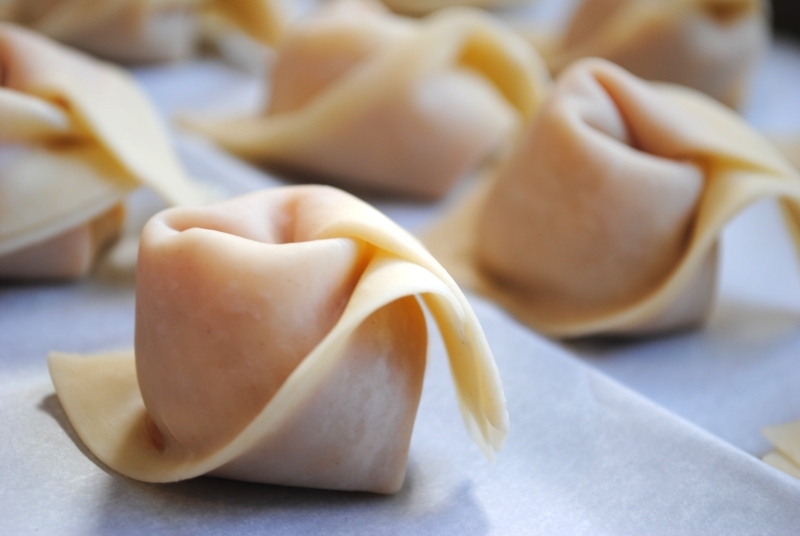 I use a tortellini fold, because it’s an easy fold that allows me to crank out a batch of 100 quickly. 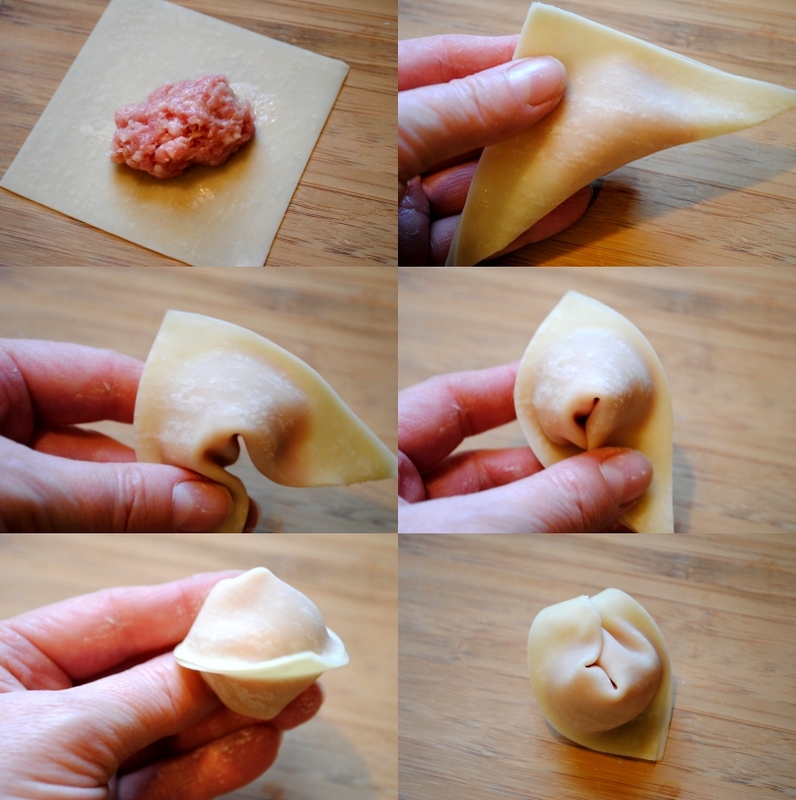 Place a small amount of pork mixture in the center of a wonton wrapper. 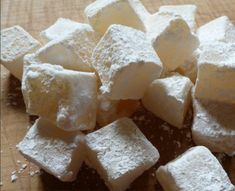 Moisten outside edges of the wrapper with a finger dipped in water. 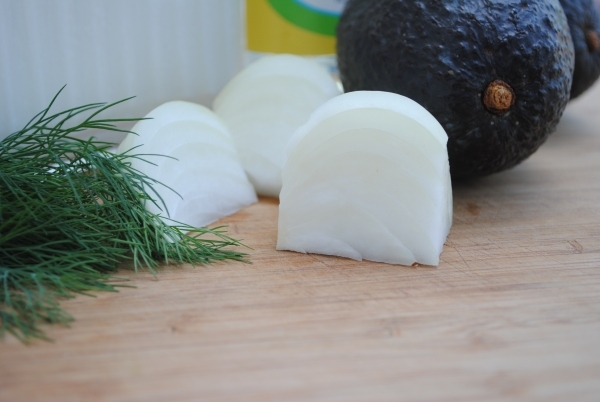 Fold in half to form a triangle, and press the moistened edges together to seal. Pull the outside corners of the triangle towards the middle. Moisten one of the corners with a little water, and press the corners together, and then flip the main part of the wonton over the top of your thumb while pinching the corners together, as pictured. To make the soup, place the broth, ginger, garlic, and fish sauce in your soup pot, and bring up to a gentle boil. Add your wontons to the broth (fresh or frozen), and simmer for about 10 minutes. 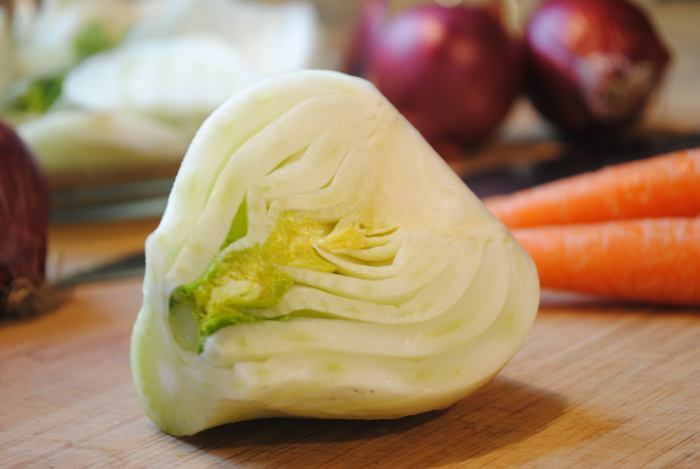 Add chopped bok choy to the soup, and take it off the heat. The heat of the soup will wilt the greens, but they will still maintain a satisfying crunch. This is a versatile recipe. You can use more or less broth and greens as you like. I prefer more greens and load it up with wontons. I love homemade soups in general. 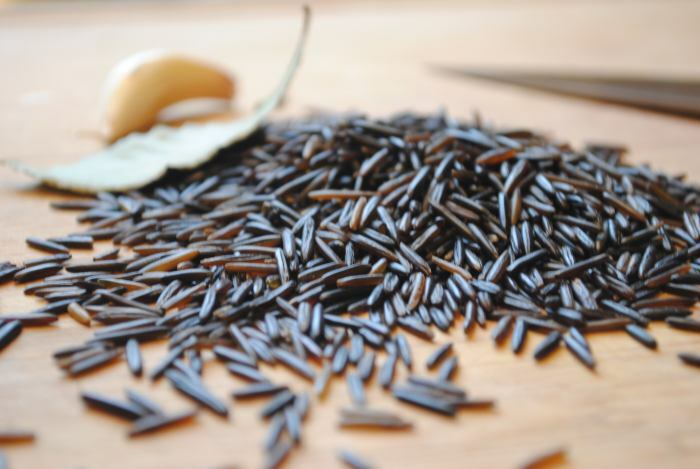 They tend to be quick, versatile, and nutritious. Soups help me economize both time and leftovers. Some can be thrown together quickly when crunched for time, others can be simmered in a slow cooker to be ready and waiting at the end of a long hard day. 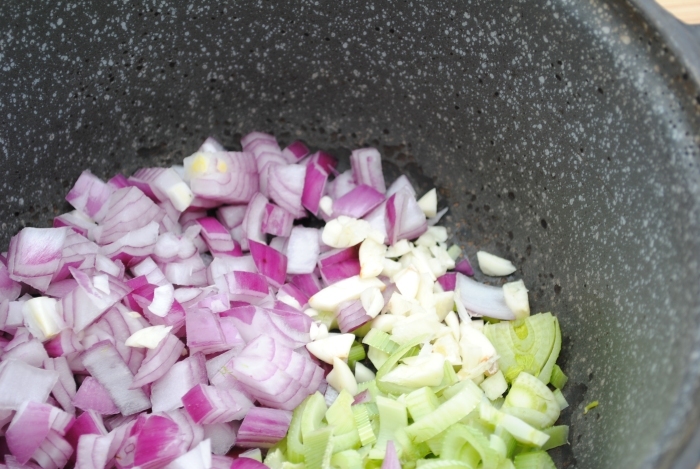 I do have a few soup recipes requiring quite a bit of prep, and not for the faint of heart cook…. like my Hot & Sour Soup. I like to freeze leftover soups, which provide a quick solution on those days when things don’t go as planned, or I suddenly find myself with a house full of unexpected guests (usually hungry teenage boys). Today I was in the mood for soup, but we’re having unseasonable, record-setting 85 degree weather. I’m still in winter food mode, and having a difficult time switching culinary gears. It’s simply too warm for something like my Fire Roasted Tomato and Wild Rice Soup, and Chilled Avocado Soup is just all wrong for March. My BLT Soup recipe, with its light potato soup base and fresh raw veggies, is perfect for transitioning seasons. 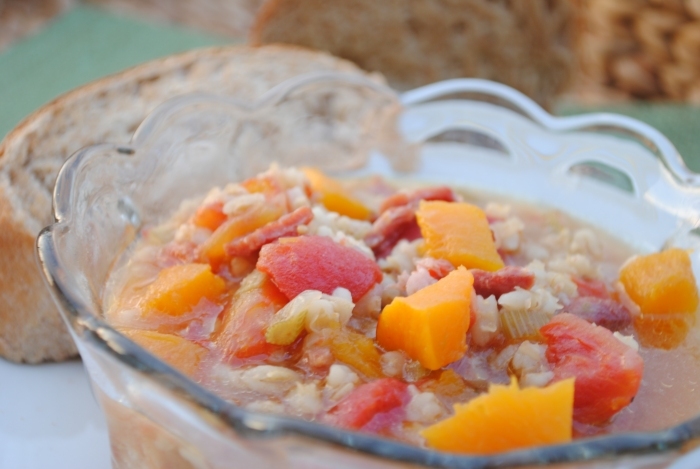 This recipe was inspired by a similar soup I had in a restaurant years ago. 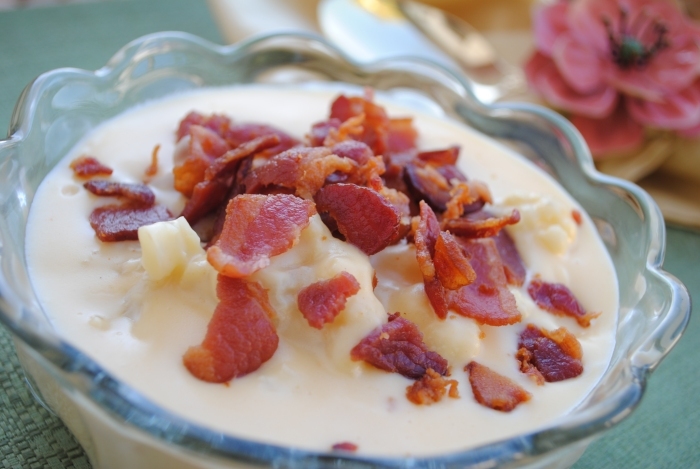 I did find a few BLT soup recipes online, but not like the one I ate all those years ago. After some tinkering this is what I ended up with. 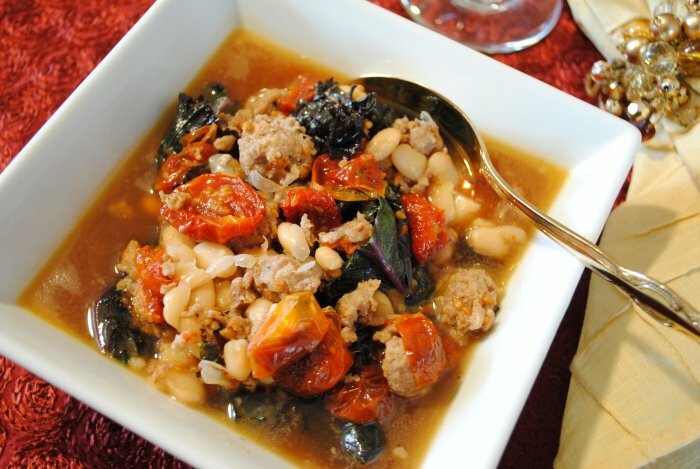 If you make your croutons and bacon ahead of time, this soup can be relatively quick to put together. Here’s my bacon technique (I get some really great bacon made from organic pastured pork, and no added nitrates). 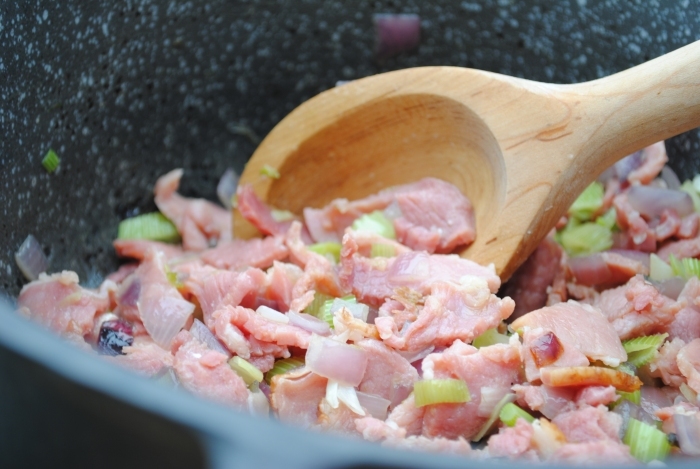 I cut the bacon into pieces using my kitchen shears, and then toss it in the pan to cook. I try to keep a jar of crumbled bacon on hand in the refrigerator as a quick salad topping. 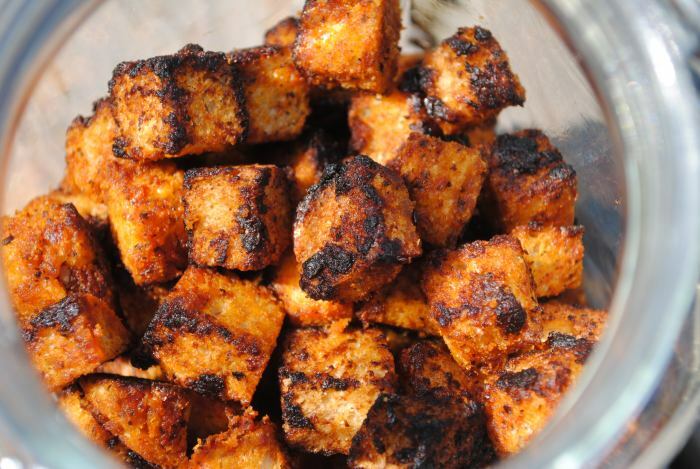 See my earlier post for making Zesty Tomato Garlic Croutons …. or use store-bought if you prefer. Melt butter and olive oil in a pan over medium heat. Add diced potatoes and cook until tender. Don’t worry about the potatoes sticking to the bottom of the pan a little. Once the potatoes are tender, add flour and stir until all oil and moisture is absorbed. Next add the chicken broth and stir until the broth starts to heat up. Mix the heaping tablespoon of corn starch with 2 or 3 tablespoons of water, and add to the broth. Continue to stir until the soup thickens. Salt and pepper to taste. This is one of those soups that does not have to be served piping hot. In fact, I like to wait for it to cool a little before I assemble my bowls. 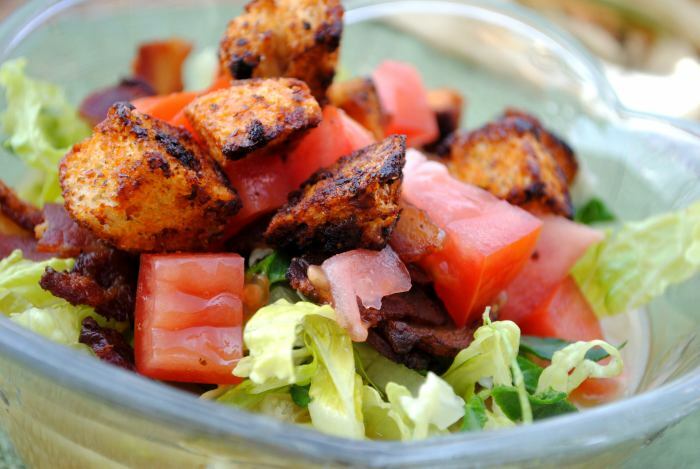 Assemble by ladling soup into bowls and then topping with bacon, lettuce, tomato, and croutons. I am long, long overdue to post a recipe. In fact, I was looking over post archives, and noticed that I didn’t post a single thing last January. It must be a hibernation thing. All I feel like doing lately is snuggling in with a pair of knitting needles, a pot of herb tea, and a pair of warm squishy socks. This morning I was forced to come out of hibernation, thanks to several inches of snow last night. I had to bundle up and dig out my chicken coop so I could feed the girls. 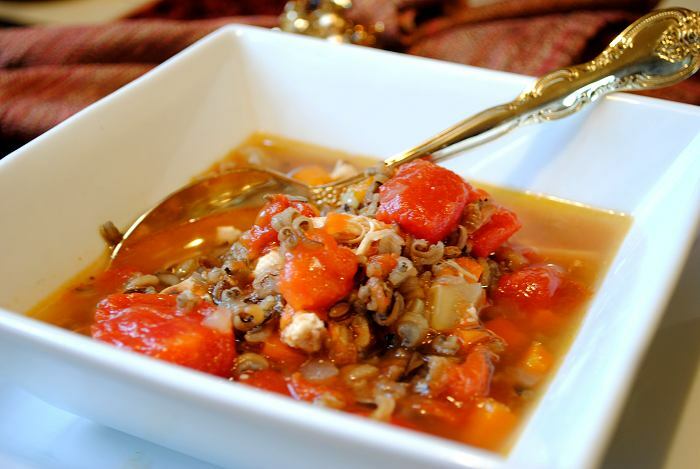 This particular soup recipe is a winter regular in my household, and my 16-year-old son’s favorite. I always make this after we’ve had a roast chicken, using the leftover meat and stock that I’ve made from the carcass. The rest of the ingredients are always on hand in my pantry and root cellar from late summer preserving efforts. I used up the last of my fennel at Christmas when I made Pasta E Fagioli Salad with Fennel for my overseas house guests, but I found some nice fat organic bulbs at a local grocer. I know I’ve mentioned it before, but I’m going to tell you again …. I don’t cook with celery. I think it’s an evil, vile, nasty vegetable, and my husband is allergic. The carrots were pulled from the winter garden tunnel last week. Soften carrots, fennel, onion, and garlic in olive oil. Add chicken broth, rice, and bay leaf; bring to a simmer, cover and cook until rice is tender. 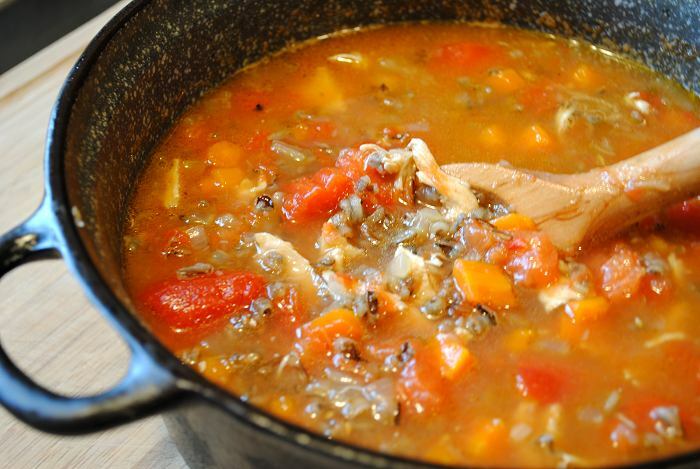 Add leftover chicken and tomatoes and their juices to the soup. Salt to taste. Bring soup up to temperature and serve. Temperatures are creeping back into the 90’s and the warmer the weather, the less I feel like eating hot food. 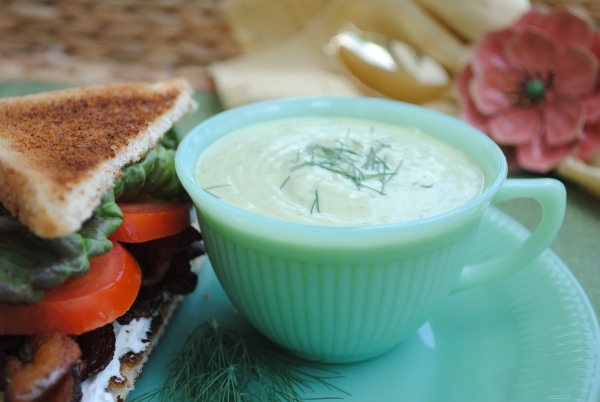 One of my favorite cold meals this summer has been chilled avocado soup and BLT sandwiches. It’s so easy to cook some extra bacon over the weekend and keep it stashed in my refrigerator for use later in the week. One of my favorite ways to make a BLT is with a little softened goat cheese spread on my toast, instead of the usual mayo. The soup takes 10 minutes to make, including the time it takes to clean up my food processor. I’ve even been known to whip up a half batch in a large Pyrex measuring cup using a hand held immersion blender. The ingredients are so simple. Scoop avocado flesh from skins with a spoon into a food processor or blender. Add buttermilk, onion, vinegar, and dill. Puree until smooth. Add salt to taste. Cover mixture and refrigerate until well chilled. Serves 4.